Prior Gigs: The Artistic Pony- Humane Society Benefit, and Open House in Solvang. Influences: J.J. Cale, The Beatles, Jessie Colin Young and Sheryl Crow among the many. The Skinny: Being a Santa Ynez citizen has definitely made Nicolette Birnie appreciate the nature around her, especially her love for horses. Sometimes classified as “the romantic cowgirl,” Nicolette’s first album fuses together her love for horses into a country-folk inspired 13-track disc. It seems that from the very beginning Nicolette was destined to get somewhere and show her true talents. With her exceptional riding skills and knowledge of horses, she was commissioned to fly to Nashville and build a horse farm for country singer Kix Brooks-of Brooks and Dunn fame. There she was introduced to a member of Reba McEntire’s band, guitarist Kent Wells. The friendship that formed between Birnie and Wells began with their shared love of music, and later gave Birnie the chance to record her first album. 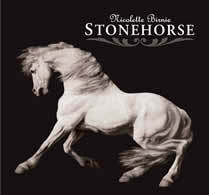 Presently, Nicolette is working on putting together a concert-type release party for her album, set to be themed to match her love of horses. The purpose of all of this, you ask? Nicolette hopes to raise awareness to the American people on the issues affecting wild horses, as well as the congressional legislation which deals with the slaughter of these animals. Next Gig: The Annual Spring Fling at Varian Ariabian’s in Arroyo Grande.